Of course Island Health is unconcerned – when has the Water Superintendent advised them of turbidity? The post below is concerning water reports backing up my comment at the bottom of James Wood’s article. Great reporter! 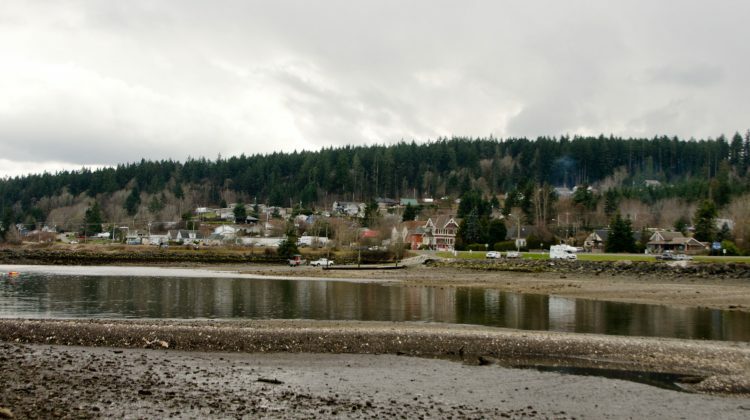 UNION BAY, B.C- Island Health is not sounding any alarms about the water quality in Union Bay, despite concerns from at least one trustee in the area’s improvement district government. 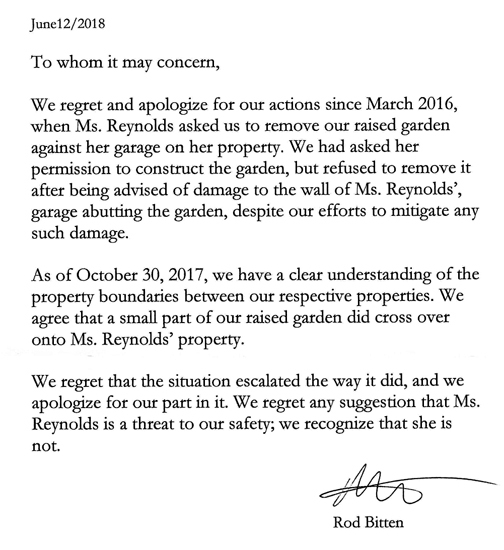 In recent weeks, Union Bay Improvement District (UBID) trustee Susanna Kaljur has been raising concerns about the water system in the area, which eventually resulted in her being ejected from an October board meeting and a “safety message” being distributed from the chair of UBID, Ted Haraldson. Kaljur has been seeking a report on the UBID water system’s turbidity measurements, and asking about the UBID procedures for issuing boil-water notices. In a statement in response to Haraldson’s message, Kaljur took issue with turbidity readings from the early months of 2017, which were above 1.0. 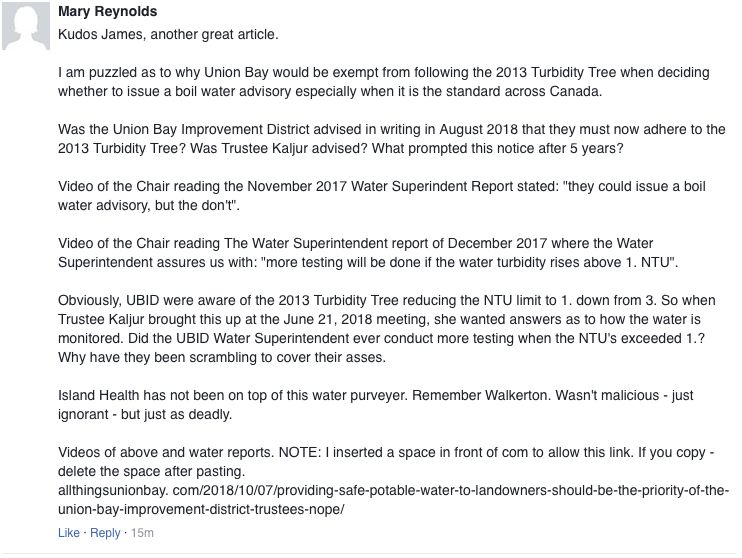 “Not providing a response with regards to the missing Water Report which is supposed to explain what UBID has done in the past when water measured from Langley Lake indicates greater than 1.0 NTU’s is unreasonable and undemocratic and possibly unsafe!” read part of Kaljur’s statement. Kaljur wanted “accurate information” from the district about water management. “Providing a thorough water report written by our Public works Superintendent explaining what specifically UBID does when NTU’s are greater than 1.0 including what extra testing is done and what are these tests measuring would be a necessary first step restoring public trust and accountability,” read Kaljur’s statement. At the last public board meeting on November 15th, Haraldson indicated that report was coming. “A report is coming out,” said Haraldson, at the time. Meanwhile, Island Health has indicated nothing is wrong with the water quality in Union Bay. That’s according to Charmaine Enns, a medical health officer with Island Health. The MyComoxValleyNow.comnewsroom had reached out to Island Health to get the official word on turbidity and Union Bay’s water system, and Enns supplied information. According to Enn’s, Union Bay’s thresholds for unacceptable turbidity were changed in August of 2018, down to 1.0 NTU’s (Nephelometric Turbidity Units) from a previous level of 3.0. NTU measurement is used to evaluate how much material is suspended in water. “Drinking water decisions and turbidity have been an evolution over the last 20 years,” said Enns, in an emailed statement. Enns indicated that boil water notices are done by water operators, after they either consult or notify Island Health based on their concerns. “We can insist on a water supplier to issue an BWN or even bypass a water supplier but that would be quite exceptional,” said Enns. Enns indicated that UBID’s NTU readings were above 1.0 in late 2016 and early 2017, with readings of 1.6 in November of 2016 and 2.17 in February of 2017. “The provincial turbidity decision tree had not been formally adopted at that time and a historically accepted 3 NTU was still the accepted threshold,” said Enns. Enns also told the MyComoxValleyNow.com newsroom that there have been no recent instances of NTU’s above one, even with rainy weather. “Normally, we usually see higher turbidity in the earlier storm seasons in the fall,” said Enns.